When my daughter Lisa* started at a preschool group, the staff noticed that she was a bit ‘airy fairy’, spaced out, not in the present moment or connected with what was going on. If I was with a friend she would just sit quietly and was withdrawn. She became very affectionate and kept asking for a baby brother or sister, someone to play with. When she was 2,5 years old, her brother Billy* was born and she was very jealous and started to physically attack. Lisa never really settled in the playgroup and the staff found it difficult to get her involved with the other children. At four years old she started school and started to behave aggressively when she came home: shouting, throwing things around, fighting with her little brother, etc. She seemed very angry and distressed. School responded with more discipline; she had to sit on the naughty step and got punished for her behaviour, but it had no effect whatsoever. If anything, she seemed to get more and more distressed. In year 1 she was really wound up, deeply depressed, withdrawn, not talking to anyone. To top it off she was accused of aggressive behaviour by her two best friends. The school advised me to be firm and discipline her but I wondered if that was the way forward. We saw a private education consultant who specialised in sensory integration issues. She discovered that Lisa was dyslexic and all her senses were out of balance and she couldn’t process stimuli in a coherent manner. The behaviour was caused by fear and anxiety because she was so overwhelmed and distressed by her environment. I then started to home-educate but that didn’t go too well; I struggled to connect to other home educating parents and experienced disapproval and judgement from school which made me feel uncomfortable. My son Billy was slow to learn to walk and talk. He was only breastfed, and when I started to wean from six months he became underweight. We consulted a dietitian who concluded that carbohydrates (e.g. wheat, rice, potatoes, etc.) didn’t agree with him [food sensitivities are very common in children with Sensual OE]. He felt isolated at school and didn’t reach his potential there. A friend of mine had started the Natasha Campbell gut and psychology diet to treat ADHD and we followed suit. We gave up carbohydrates apart from simple fruit and vegetables and we all felt better for it. My ME and chronic fatigue cleared up, and Billy was gaining weight and was no longer getting ill. We all hugely improved our health because we recognised our sensitivity and our diet was better. 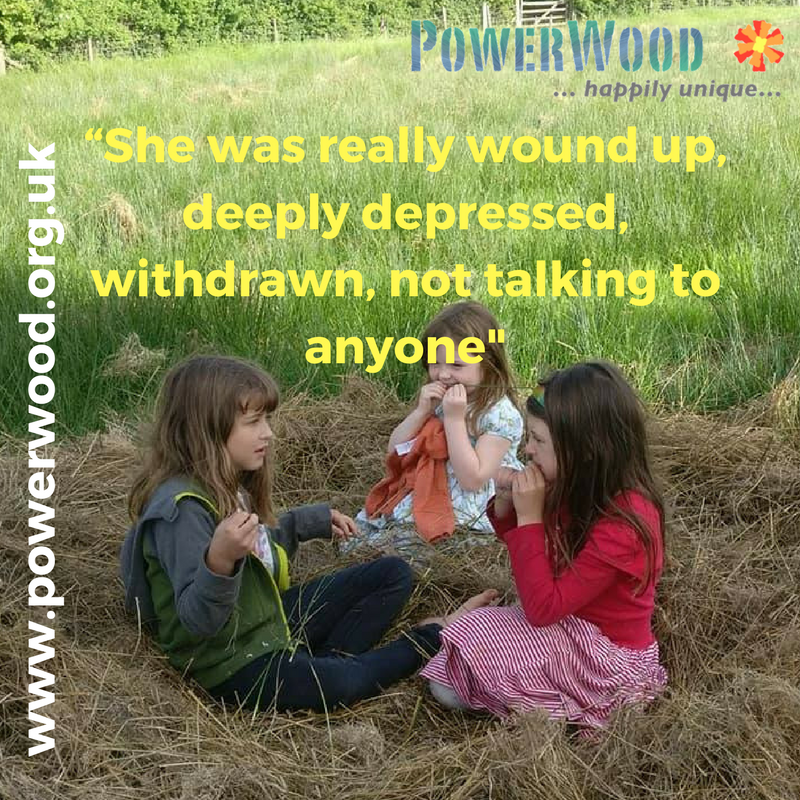 When we first attended the PowerWood Camp six years ago, I felt a bit overwhelmed by all the theory and group discussions. I could see the intensity, super-sensitivity and hyper-reactivity in myself, and the children loved playing with the other kids. I participated in the groups and workshops whilst my husband was doing all the cooking etc. with made it quite intense. I learned about being sensitive and stopped feeling bad about myself because of it. Before I could feel guilty or embarrassed by my sensitivity, for example, if I was moved to tears by an opera. From childhood I have felt that I am different, that I don’t belong, now I knew this is part of having ‘Emotional OE’ and I try to look after my emotional well being. This year we attended the Camp for the second time and it was a different experience again because I was in a different place myself. I found it very helpful to listen to other parents and connect with mums with a similar approach and values. One of the big lessons that we learned is that my husband and I have to look after ourselves, otherwise we have nothing to give to our children. It was interesting to see the OE-children behave physically like they have a need to fight sometimes. Mine have really calmed down since the Camp. The workshop with Simone about siblings was very helpful, and also doing the role-play. Simone is very skilful in holding the space for the group. It really helped me to hear from parents with similar experiences and also from Simone about her challenges that she faced with her children growing up. There was an open atmosphere without judgement, creating a safe space to share. It gave me insight, support and ideas about ways to move forward. I like that we were free to choose what suits the family and children, for instance, we did lots of activities that are nurturing for ourselves (like yoga and singing) and the children could join in if they wanted to. Normally we struggle to find the time and money to do this. All of us thoroughly enjoyed nature and the campfire. The Camp has really given me many more skills in dealing with my children’s challenging behaviour. My kids seem more confident afterwards as they have had lots of fun playing with other intense children for a week. They made new friends, developed more social confidence and felt part of a pack with the other children. Lisa got lots of positive feedback from the adults for looking after the little ones and was moderating when there were conflicts. Through this, she was able to rise above the fighting with her own brother. If one of the children got angry or stressed out at the Camp, the response was accepting rather than criticising or judging. They were giving each other space to experience their emotions. I have learned to converse with my children about how to manage emotions like anger. The Camp has given me positive tools to move forward with my own, my children’s and our family life. Best of all, it was relaxing and fun as a family. I feel grateful for finding these resources after my struggle and would certainly recommend attending the PowerWood Camp to anyone who is facing similar challenges.